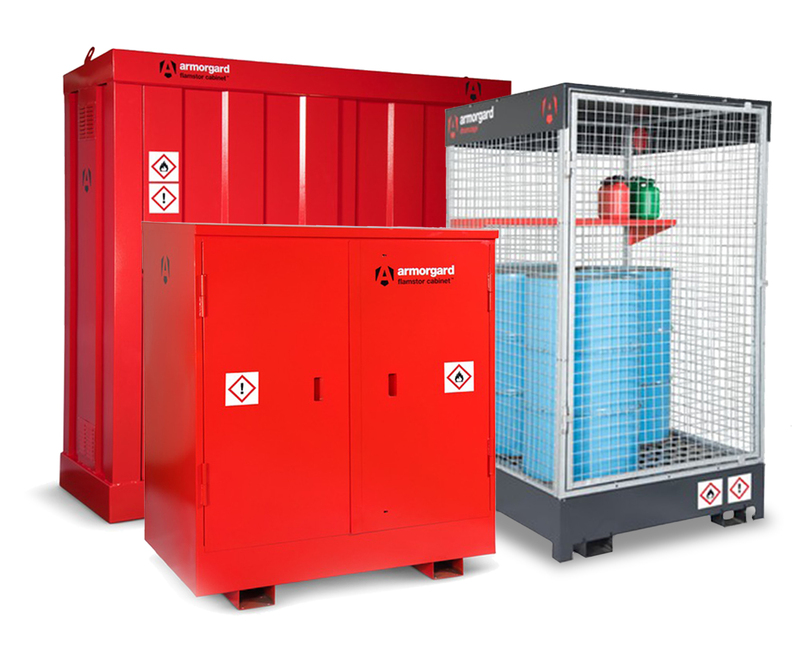 Armorgard has announced the launch of two new hazardous product storage solutions - FlamStor Cabinet, a secure place to store oil and fuel containers, and DrumCage - a storage unit for both hazardous gases and liquids. The launch marks Armorgard’s ongoing commitment to providing innovative solutions to help businesses improve safe working practices in the most affordable and effective ways. The demand for hazardous product storage solutions comes mainly from the requirement to meet Control of Substances Hazardous to Health (COSHH) Regulations in the UK, and a growing trend among businesses to reduce risks and keep employees safe, as well as improving the efficiency of operations. FlamStor™ is a secure cabinet designed to keep bulk containers of fuel or oil safe, organised and accessible with specially designed flameproof vents to prevent build-up of fumes. The DrumCage™ is a robust, transportable unit for both gases and liquids. The unique design features a fully welded sump storage unit, mesh side and door panels, forklift skids and weatherproof roof. Both products are ideal for warehousing or any business that stores hazardous goods. Why FlamStor Cabinet and DrumCage? Regulations - Implement a system proven to achieve COSHH compliance and meet all hazardous goods storage regulations. Protect Employees - Your people are your greatest asset. Provide them with best practice hazardous goods storage for their protection. Manage Risk - Avoid heavy fines for noncompliance and insurance claims. Maintain your company’s reputation. Save Time - Using our new products allows much quicker and easier identification and management of your hazardous goods compared to outdated storage systems.